The United States Army Air Corps (USAAC) was the statutory forerunner of the United States Air Force. Renamed from the Air Service on 2 July 1926, it was part of the United States Army and the immediate predecessor of the United States Army Air Forces (USAAF), established on June 20, 1941. Although abolished as an administrative echelon in 1942, the Air Corps (AC) remained as one of the combat arms of the Army until 1947. The Air Corps was renamed by the United States Congress largely as a compromise between advocates of a separate air arm and those of the Army high command who viewed the aviation arm as an auxiliary branch to support the ground forces. Although its members worked to promote the concept of airpower and an autonomous air force between 1926 and 1941, its primary purpose by Army policy remained support of ground forces rather than independent operations. On 1 March 1935, still struggling with the issue of a separate air arm, the Army activated the General Headquarters Air Force for centralized control of aviation combat units within the continental United States, separate from but coordinate with the Air Corps. The separation of the Air Corps from control of its combat units caused problems of unity of command that became more acute as the Air Corps enlarged in preparation for World War II. This was resolved by the creation of the Army Air Forces on 20 June 1941, when both organizations became subordinate to the new higher echelon. The Air Service had a brief but turbulent history. Created during World War I by executive order, it gained permanent legislative authority in 1920 as a combatant arm of the line of the United States Army. There followed a six-year struggle between adherents of airpower and the supporters of the traditional military services about the value of an independent Air Force, intensified by struggles for funds caused by skimpy budgets, as much an impetus for independence as any other factor. The Lassiter Board, a group of General Staff officers, recommended in 1923 that the Air Service be augmented by an offensive force of bombardment and pursuit units under the command of Army general headquarters in time of war, and many of its recommendations became Army regulations. The War Department desired to implement the Lassiter Board's recommendations, but the administration of President Calvin Coolidge chose instead to economize by radically cutting military budgets, particularly the Army's. [n 1] The Lampert Committee of the House of Representatives in December 1925 proposed a unified air force independent of the Army and Navy, plus a department of defense to coordinate the three armed services. However another board, headed by Dwight Morrow, was appointed in September 1925 by Coolidge ostensibly to study the "best means of developing and applying aircraft in national defense" but in actuality to minimize the political impact of the pending court-martial of Billy Mitchell (and to preempt the findings of the Lampert Committee). It declared that no threat of air attack was likely to exist to the United States, rejected the idea of a department of defense and a separate department of air, and recommended only minor reforms that included renaming the Air Service to allow it "more prestige." The position of the air arm within the Department of War remained essentially the same as before, that is, the flying units were under the operational control of the various ground forces corps area commands and not the Air Corps, which remained responsible only for procurement and maintenance of aircraft, supply, and training. Because of a lack of legally specified duties and responsibilities, the new position of Assistant Secretary of War for Air, held by F. Trubee Davison from July 1926 to March 1933, proved of little help in promoting autonomy for the air arm. Most pursuit fighters before 1935 were of the Curtiss P-1 Hawk (1926–1930) and Boeing P-12 (1929–1935) families, and before the 1934 introduction of the all-metal monoplane, most front-line bombers were canvas-and-wood variants of the radial engined Keystone LB-6 (60 LB-5A, LB-6 and LB-7 bombers) and B-3A (127 B-3A, B-4A, B-5, and B-6A bombers) designs. [n 6] Between 1927 and 1934, the Curtiss O-1 was the most numerous of the 19 different types and series of observation craft and its A-3 variant the most numerous of the attack planes that fulfilled the observation/close support role designated by the General Staff as the primary mission of the Air Corps. By 1933 the Air Corps expanded to a tactical strength of 50 squadrons: 21 pursuit, 13 observation, 12 bombardment, and 4 attack. All were understrength in aircraft and men, particularly officers, which resulted in most being commanded by junior officers (commonly first lieutenants)[n 7] instead of by majors as authorized. The last open-cockpit fighter used by the USAAC, the P-26, came into service in 1933 and bridged the gap between the biplane and more modern fighters. The Air Corps was called upon in early 1934 to deliver mail in the wake of the Air Mail scandal, involving the postmaster general and heads of the airlines. Despite an embarrassing performance that resulted in a number of crashes and 12 fatalities, the investigating boards that followed recommended organizational and modernization changes that again set the Air Corps on the path to autonomy and eventual separation from the Army. A force of 2,320 aircraft was recommended by one board,[n 8] and authorized by Congress in June 1936, but appropriations to build up the force were denied by the administration until 1939, when the probability of war became apparent. Instead, the Air Corps inventory actually declined to 855 total aircraft in 1936, a year after the creation of GHQ Air Force, which by itself was recommended to have a strength of 980. The open insurgency between 1920 and 1935 of airmen foreseeing a need for an independent air force in order to develop fully the potential of airpower had cost the careers of two of its near-legendary lights, Foulois and Mitchell, and nearly cost the reputation of two others, Pratt and Henry H. Arnold. In terms of the principle of civilian control of the military in peacetime, their tactics and behavior were clearly inappropriate. The political struggle had temporarily alienated supporters in Congress, had been counterproductive of the development of the Air Corps in the short run, and had hardened the opposition of an already antagonistic General Staff. But through their mistakes and repeated rebuffs, the airmen had learned what they were lacking to prove the argument that the Air Corps could perform a unique mission—strategic bombardment—and the real threat of another world war would soon reverse their fortunes. The Air Corps in January 1931 "got its foot in the door" for developing a mission for which only it would have capability, while at the same time creating a need for technological advancement of its equipment. Chief of Naval Operations Admiral William V. Pratt was desirous of having general assent to his proposition that all naval aviation including land-based aircraft was by definition tied to carrier-based fleet operations. Pratt reached an agreement with new Army Chief of Staff Douglas MacArthur that the Air Corps would assume responsibility for coastal defense (traditionally a primary function of the Army but only a secondary, war-time function of the Navy) beyond the range of the Army's Coast Artillery guns, ending the Navy's apparent duplication of effort in coastal air operations. The agreement, intended as a modification of the Joint Action statement on coastal defense issued in 1926, was not endorsed by the Joint Army-Navy Board and never had authority other than personal agreement between the two heads of service. Though the Navy repudiated the statement when Pratt retired in 1934, the Air Corps clung to the mission, and provided itself with the basis for development of long range bombers and creating new doctrine to employ them. The formulation of theories of strategic bombing gave new impetus to the argument for an independent air force. Strategic or long-range bombardment was intended to destroy an enemy nation's industry and war-making potential, and only an independent service would have a free hand to do so. But despite what it perceived as "obstruction" from the War Department, much of which was attributable to a shortage of funds, the Air Corps made great strides during the 1930s. A doctrine emerged that stressed precision bombing of industrial targets by heavily armed long-range aircraft. Test flight of the Boeing Y1B-9 bomber in 1932. At the time it was faster than any existing pursuit plane. New bomber types under development clearly outperformed new pursuit types, particularly in speed and altitude, then considered the primary defenses against interception. In both 1932 and 1933, large-scale maneuvers found fighters unable to climb to altitude quickly enough to intercept attacking Y1B-9 and B-10 prototypes, a failure so complete that Westover, following the 1933 maneuvers, actually proposed elimination of pursuits altogether. The successful development of the Martin B-10 and subsequent orders after 1935 for more than 150 (including its B-12 variant) continued the hegemony of the bomber within the Air Corps. The B-10 featured innovations that became standard for the next decade: an all-metal monoplane, closed cockpits, rotating gun turrets, retractable landing gear, internal bomb bay, and full engine cowlings. The superiority of bombers resulted in a 1934 feasibility study for a 35-ton 4-engined bomber (the Boeing XB-15) that, while later found to be unsuitable for combat because the power of existing engines was inadequate for its weight, led to the design of the smaller Model 299, later to become the B-17 Flying Fortress, whose first flight was at the end of July 1935. By that time the Air Corps had two projects in place for the development of longer-ranged bombers, Project A for a bomber with a ferry range of 5,000 miles (8,000 km), and Project D, for one of a range of up to 10,000 miles (16,000 km). In June 1936 the Air Corps requested 11 B-15s and 50 B-17s for reinforcing hemispheric defense forces in Hawaii, Alaska, and Panama. The request was rejected on the basis that there were no strategic requirements for aircraft of such capabilities. In the fall of 1937 the Army War College's course on the use of airpower reiterated the General Staff position and taught that airpower was of limited value when employed independently. Using attaché reports from both Spain and Ethiopia, and endorsed by a senior Air Corps instructor, Col. Byron Q. Jones,[n 14] the course declared that the Flying Fortress concept had "died in Spain", and that airpower was useful mainly as "long range artillery." Air Corps officers in the G-3 Department of the General Staff pointed out that Jones' conclusions were inconsistent with the revised TR 440-15, but their views were dismissed by the Deputy Chief of Staff[n 15] with the comment: "No doctrine is sacrosanct, and of all military doctrines, that of the Air Corps should be the last to be so regarded." The War Department, seeking to stifle procurement of the B-17 while belatedly recognizing that coordinated air-ground support had been long neglected, decided that it would order only two-engined "light" bombers in fiscal years 1939 through 1941. It also rejected further advancement of Project A, the development program for a very long range (VLR) bomber. [n 16] In collaboration with the Navy, the Joint Board (whose senior member was Army Chief of Staff Gen. Malin Craig) on 29 June 1938 issued a ruling that it could foresee no use for a long range bomber in future conflict. As a direct result, the last planned order of long range bombers (67 B-17s) was cancelled by Craig[n 17] and a moratorium on further development of them was put into effect by restricting R&D funding to only medium and light bombers. This policy would last less than a year, as it went against not only the trends of technological development, but against the geopolitical realities of coming war. [n 18] In August 1939 the Army's research and development program for 1941 was modified with the addition of nearly five million dollars to buy five long range bombers for experimental purposes, resulting on 10 November 1939 in the request by Arnold of the developmental program that would create the Boeing B-29 Superfortress, which was approved on 2 December. Between 1930 and 1938 the Air Corps had obtained a mission in coastal defense that justified both the creation of a centralized strike force and the development of four-engined bombers, and over the resistance of the General Staff lobbied for another mission, strategic bombardment, with which it could persuasively argue for independence from the Army. The cost of the General Staff's resistance in terms of preparedness had been severe, however. Its policies had resulted in the acquisition of obsolete aircraft as first-line equipment, stifled design development in the private sector of better types, retarded the development of radar and ordnance, and handicapped training, doctrine, and offensive organization by reneging on commitments to acquire the B-17. "From October 1935 until 30 June 1939, the Air Corps requested 206 B-17's and 11 B-15's. Yet because of cancellations and reductions of these requests by the War Department, only 14 four-engine planes were delivered to the air force up to the outbreak of World War II in September 1939." A major step toward creation of a separate air force occurred on 1 March 1935 with the activation of a centralized, air force-level command headed by an aviator answering directly to the Army Chief of Staff. Called the General Headquarters Air Force, the organization had existed in Army planning since 1924 as a subordinate element of Army General Headquarters, which would be activated to control all Army units in case of war mobilization. In anticipation of military intervention Cuba in 1933,[n 19] the headquarters had been created on 1 October but not staffed. [n 20] The Drum Board of 1933 had first endorsed the concept, but as a means of reintegrating the Air Corps into control by the General Staff, in effect reining it in. Among the recommendations of the Baker Board, established in the wake of the Air Mail scandal, was that the proposals of the Drum Board be adopted: an increase in strength to 2,320 aircraft and establishment of GHQ Air Force as a permanent peacetime tactical organization, both to ameliorate the pressures for a separate air force and to exploit emerging capabilities in airpower. In the absence of a general headquarters (i.e. peacetime), GHQ Air Force would report to the General Staff. The War Plans Division of the Army reacted to the recommendations of the Baker Board by insisting that men and modern equipment for seven army divisions be procured before any increase in the Air Corps was begun, and opposed any immediate attempt to bring the Air Corps up to the 1,800 plane-strength first authorized in 1926, for fear of antagonizing the Navy. [n 21] President Roosevelt approved an open-ended program to increase strength to 2,320 aircraft (albeit without any proviso for funding) in August 1934, and Secretary Dern approved the activation of GHQ Air Force in December 1934. GHQ Air Force took control of all combat air units in the United States from the jurisdiction of corps area commanders, where it had resided since 1920, and organized them operationally into a strike force of three wings. [n 22] The GHQ Air Force remained small in comparison to European air forces. On its first day of existence, the command consisted of 60 bombers, 42 attack aircraft, 146 pursuits, and 24 transports, only 40% of strength in the tables of organization. Administratively it organized the forces into four geographical districts (that later became the first four numbered air forces) that paralleled the four field army headquarters created in 1933. Lines of authority were also difficult as GHQ Air Force controlled only combat flying units within the continental United States. The Air Corps was responsible for training, aircraft development, doctrine, and supply, while the ground forces corps area commanders still controlled installations and the personnel manning them. An example of the difficulties this arrangement imposed on commanders was that while the commander of GHQ Air Force was responsible for the discipline of his command, he had no court martial authority over his personnel, which was retained by the corps area commander. Base commanders of Air Corps installations reported to as many as four different higher echelons. [n 24] The issue of control of bases was ameliorated in 1936 when GHQAF bases were exempted from corps area authority on recommendation of the Inspector General's Department, but in November 1940 it was restored again when Army General Headquarters was activated. In January 1936, the Air Corps contracted with Boeing for thirteen Y1B-17 Flying Fortress prototypes, enough to equip one squadron for operational testing and a thirteenth aircraft for stress testing, with deliveries made from January to August 1937. The cost of the aircraft disturbed Secretary of War Harry Woodring, who denied requests for further purchases, so that although the air arm embraced strategic bombing as its primary doctrine after the creation of GHQ Air Force, by 1938 there were still only thirteen on hand. On 18 March 1938 Secretary Woodring implemented a plan that included the purchase of 144 four-engine bombers, but approval was reversed in July following the moratorium against the long-range bomber program issued by the Joint Board. [n 25] The purchase of 67 B-17s (five squadrons) in FY 1940 as an increment of the Woodring program, using carryover funds, was cancelled by Craig. The moratorium also resulted from the enmity of the Navy incurred by the Air Corps on 12 May 1938 when it widely publicized the interception of the Italian ocean liner Rex by three B-17s while it was 620 nautical miles (1,100 km) off-shore of New York City. [n 26] Possibly under pressure from the Navy, Craig placed a limit of 100 nautical miles (190 km) on all future off-shore flights by the Army. The services together issued a revised Joint Action statement in November reasserting that the mission of the Air Corps in coastal defense was only for supporting the Navy if called upon to do so, while simultaneously authorizing for the Navy the long-range shore-based coastal patrol mission denied the Air Corps. Westover, who stridently opposed cancellation of the Woodring program, was killed in an air crash on 21 September 1938 and was succeeded by Arnold. Even with the doctrine of strategic bombardment as its priority, the Air Corps belatedly sought to modernize its tactical combat force under GHQ Air Force, bringing into service the Northrop A-17 and Douglas B-18 Bolo in 1936, the Seversky P-35 in 1937, and the Curtiss P-36 in 1938. However all of these aircraft were obsolete by the time they came into service, and the outbreak of war in Europe spurred development of more capable types. By October 1940, over a year before the United States was drawn into the war, every piston-driven single-seat fighter eventually used by the USAAF during World War II was in flight test except the Republic P-47 Thunderbolt. However, the press of the enormous tasks confronting the Air Corps and the primacy of strategic bombing doctrine meant that development of a long-range capability for these new single-engined fighters was not undertaken until combat losses to bombers forced the issue. Arnold, at the direction of President Roosevelt in January 1939, oversaw an expansion of the Air Corps that saw it double in size from 15 to 30 groups by the end of 1940. The separation of the combat organization (GHQ Air Force) from the logistic organization (Air Corps) created serious problems of coordination nearly identical to the Division of Military Aeronautics/Bureau of Aircraft Production dual-authority mess of World War I. In March 1939, with the replacement of Andrews as commander of GHQ Air Force by Maj. Gen. Delos C. Emmons, Arnold was also nominally assigned to "supervise" the tactical force, but divisions were not entirely resolved. On 5 October 1940, Arnold drew up a proposal for creating an air staff, unifying the air arm under one commander, and giving it autonomy with the ground and supply forces—a plan which was eventually adopted in March 1942—and submitted it to Chief of Staff George C. Marshall, but it was immediately opposed by the General Staff in all respects. Instead, the two organizations were separated again by a directive from Marshall on 19 November 1940. Army GHQ was activated (more than five years after the activation of GHQ Air Force) and GHQ AF placed under it. Its logistical and training structure remained under direct control of the chief of staff and its airfields under corps commanders. However Arnold had joined the General Staff as acting "Deputy Chief of Staff for Air" on 11 November 1940, a position that enabled him to coordinate the two sections of the air arm until the organizational problems were repaired. Even so, Maj. Gen. George H. Brett, acting Chief of Air Corps in Arnold's absence, denounced the plan as "disastrous in war". The problems engendered by the lack of unity of command were further exacerbated by the assignment of GHQ Air Force to Army GHQ. Emmons, who had begun his tour junior to Arnold, was promoted to lieutenant general to make him equal to the commanders of the field armies also controlled by Army GHQ. This forced him to report to and act under an inferior in rank (both Arnold and Brett were major generals). 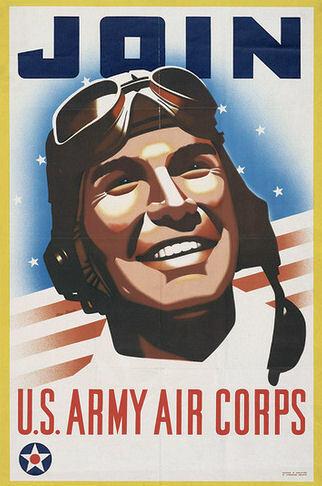 On 20 June 1941, in an attempt to end the divisions, the War Department revised Army Regulation 95-5 to create the Army Air Forces with the Air Corps and the Air Force Combat Command (a redesignation of General Headquarters Air Force) as its major components, authorized an Air Staff to manage planning and execution of expansion of the air arm, and named Arnold as Chief of the Army Air Forces. It did not, however, end the dual chain of command, as air units of Air Force Combat Command still reported to Army GHQ as well as Headquarters AAF. During World War II the role of the Air Corps changed again. On 9 March 1942, War Department Circular 59 abolished Army GHQ and organized the Army into three autonomous components: the Army Air Forces, the Army Ground Forces, and the Services of Supply, each with a commanding general reporting to the Chief of Staff. The Office of Chief of Air Corps (OCAC) was abolished as well (as was Air Force Combat Command) and the functions of the Air Corps transferred to the AAF, reducing it to a combat arm (Infantry and the other combat arms also had their chiefs abolished and functions transferred to the Army Ground Forces). The Congress did not disestablish the Army Air Corps until 26 July 1947, with the passage of the National Security Act of 1947 (61 Stat. 502). Most members of the Army Air Forces, however, also remained members of the Air Corps. In May 1945, 88 percent of officers serving in the Army Air Forces were commissioned in the Air Corps, while 82 percent of enlisted members assigned to AAF units and bases had the Air Corps as their combat arm branch. The Air Corps tested and employed a profusion of pursuit, observation, and bomber aircraft during its 15-year history. The advent of the all-metal monoplane, enclosed cockpits, retractable landing gear, enclosed bomb bays, and the emergence of strategic bombardment doctrine led to many designs in the mid and late 1930s that were still in use when the United States entered World War II. Among the key technology items developed were oxygen and cabin pressurization systems, engine superchargers (systems essential for high-altitude combat), advanced radio communication systems, such as VHF radios, and the Norden bombsight. As a further consequence of the Air Mail scandal, the Baker Board reviewed the performance of Air Corps aircraft and recognized that civilian aircraft were far superior to planes developed solely to Air Corps specifications. Following up on its recommendation, the Air Corps purchased and tested a Douglas DC-2 as the XC-32, which subsequently became the flying headquarters of Gen. Andrews. The DC-2 so exceeded Air Corps specifications that 17 were purchased under the designation C-33 to equip the first permanent transport unit, the 10th Transport Group,[n 27] activated in June 1937 at Patterson Field in Ohio. In 1939 the Air Corps recognized that it might soon require large numbers of modern air transports for use in war and purchased 35 DC-2/DC-3 hybrids, designated the C-39. After the fall of France, the Air Corps in September 1940 ordered 200 untried and unproven C-46 transports from Curtiss-Wright and 545 C-47 Skytrains, the forerunner of the more than 10,000 C-47s and related variants that served in World War II. In a special message to Congress on 12 January 1939,[n 29] President Roosevelt advised that the threat of a new war made the recommendations of the Baker Board inadequate for American defense and requested approval of a "minimum 3,000-plane increase" for the Air Corps. [n 30] On 3 April 1939, Congress allocated the $300 million requested by Roosevelt for expansion of the Air Corps, half of which was dedicated to purchasing planes to raise the inventory from 2,500 to 5,500 airplanes, and the other half for new personnel, training facilities, and bases. In June the Kilner Board[n 31] recommended several types of bombers needed to fulfill the Air Corps mission that included aircraft having tactical radii of both 3,000 miles (modified in 1940 to 4,000) and 2,000 miles. Chief of Staff Craig, long an impediment to Air Corps ambitions but nearing retirement, came around to the Air Corps viewpoint after Roosevelt's views became public. Likewise, the War Department General Staff reversed itself and concurred in the requirements, ending the brief moratorium on bomber development and paving the way for work on the B-29. Over the winter of 1938–1939, Arnold transferred a group of experienced officers to his headquarters as an unofficial air staff to lay out a plan that would increase the Air Corps to 50,000 men by June 1941. The expansion program of the Air Corps was characterized by repeated upward revision of goals for increasing aircraft production, total combat units, the training of new personnel, and construction of new bases. New combat groups were created by detaching cadres from the existing 15 Regular groups to provide the core of the new units, with the older groups providing the basis for an average of three new groups. Graduates of an expanded flight training program filled out the new groups and replaced the experienced personnel transferred from the older groups, resulting in a steady decline in the overall level of experience in the operational units. In essence, groups "self-trained" to proficiency standards set by training directives from the GHQAF. Unable to keep pace with the revised programs for expansion of combat groups, unit tactical training for all groups suffered from a shortage of equipment (particularly combat aircraft), an unavoidable preoccupation with administrative details during organization, and a lack of training facilities, especially bombing and gunnery ranges, leaving a "vast gap between the desired status of training in combat units and their actual status immediately prior to ... Pearl Harbor." When war broke out in September 1939 the plan was only halfway to its goal in manpower, and the Air Corps had only 800 first-line combat aircraft, 700 of which were declared obsolete by December 1941. [n 35] Two-thirds of its officers were second lieutenants whose only flying experience was their flight training. The Air Corps had 17 major installations and four depots, and most of its 76 airfields were co-located at civil airports or were small fields on Army posts. [n 36] The acceleration of the expansion programs resulted in an Air Corps of 156 airfields and 100,000 men by the end of 1940. Twenty civilian flight schools and eight technical training schools were contracted to provide additional training facilities, and on 10 August 1940, Pan American Airways was contracted to provide meteorological and navigation training at Coral Gables, Florida, until military schools could be established. Procurement of aircraft remained a significant problem for the Air Corps until the eve of war, because of diversion of production to the Allies. On 16 May 1940, with the fall of France imminent, President Roosevelt delivered an address to Congress calling for a supplemental appropriation of nearly a billion dollars and the manufacture of 50,000 aircraft a year for the armed forces (36,500 of them for the Air Corps). Eighteen months later the AAF still had only 3,304 combat aircraft (only 1,024 overseas), and 7,024 non-combat aircraft, of which 6,594 were trainers. Its command staff increased in October 1940 to 24 with the addition of 15 new general officer billets. [n 37] By the date the Air Corps became part of the AAF nine months later, it had 33 general officers, including four serving in observer roles to the Royal Air Force. At this stage, public opinion support of airpower reached unprecedented highs, but Arnold made a decision to postpone any attempts to exploit the opportunity to push for an independent Air Force. Assured of a free hand by Marshall, Arnold thought that it would "be a serious mistake to change the existing setup" in the midst of the crucial expansion effort, which in less than five years would be more than 100 times its June 1939 size in personnel (much of it highly trained technically) alone. This list of units is a snapshot of the Air Corps on the date of activation of General Headquarters Air Force. Except for the addition of reconnaissance (formerly observation) squadrons to the three bombardment groups in September 1936, and the May 1937 exchange of the 12th Observation Group (disbanded) for the 10th Transport Group (activated), the organization of the Air Corps shown here remained essentially unchanged until activation of the first expansion groups on 1 February 1940. * The Air Corps became a subordinate component of the Army Air Forces on 20 June 1941, and was abolished as an administrative organization on 9 March 1942. It continued to exist as one of the combat arms of the Army (along with infantry, armor, and artillery) until abolished by reorganization provisions of the National Security Act of 1947 (61 Stat. 495), 26 July 1947. ↑ Gen. Patrick's proposal of an Air Corps equivalent to the Marine Corps was characterized by Brig. Gen. Fox Conner (and not for the first nor last time by General Staff opponents of Air Corps independence) as a "promotion scheme". ↑ All Air Corps generals held temporary ranks. The Air Corps did not have a member promoted to permanent establishment general officer until 1937, and he was promptly removed from the Air Corps. ↑ Gillmore had been chief of the Supply Division of the Air Service. Both he and Lahm served only a single tour. Of the three assistant chiefs, Fechet succeeded Patrick in December 1927, Gillmore retired on 30 June 1930, and Lahm reverted back to his permanent rank on 16 July 1930. ↑ The General Staff viewed the "five-year plan" as an opponent of the Army in general and fought it bitterly, citing it as a destructive force at every opportunity. General Drum also chaired the 1933 Drum Board, created specifically to oppose (and revise) plans and appropriation requests submitted by Chief of Air Corps Foulois that were not to the General Staff's liking. ↑ The primary difference between the types is the twin-finned tail of the former, and the single vertical stabilizer of the latter design, which gave it marginally superior performance. ↑ An example is Ralph F. Stearley, who commanded the 13th Attack Squadron for four years as a 1st Lieutenant. ↑ The Drum Board, which derived the figure as the number necessary to maintain 2,072 "serviceable" planes for its worst-case scenario, War Plan Red-Orange. War plans involving Great Britain ("Red") as an opponent were not officially excluded from United States war planning until January 1938. ↑ As late as 14 October 1941, CNO Adm. Harold Stark insisted that the "proper" role of Army aviation in coastal defense was support of Navy operations. ↑ Since 1923 Army doctrine had been stated in Field Service Regulations, which were general in character, and Training Regulations, which stated combat principles for each combatant arm. TR 440-15 had been first issued on 26 January 1926 as Fundamental Principles for the Employment of the Air Service. Coincidentally, Col. William L. Mitchell resigned from the service the day following its issuance. This dichotomy of regulations and principles ended in 1939 with the creation of field manuals. ↑ The Drum Board was a panel of five generals formed in August 1933 by the General Staff to oppose recommendations by Air Corps planners for development and expansion to meet defense needs (Tate (1998) pp. 138–139), while the Baker Board was formed after the Air Mail scandal and had as its military members (who controlled the agenda) the five generals of the Drum Board (Tate pp. 143–145). ↑ Dern's characterization in February 1934 of the Air Corps' role as: "subordinated like all other elements, to whatever team it happens to accompany," leaves no doubt as to the Army's position about its purpose. ↑ Jones, an aviation pioneer and formerly a cavalry officer, was the rarest of Air Corps officers, a "true believer" in the General Staff doctrine. He was one of the few senior Air Corps officers never to have attended or instructed at the Air Corps Tactical School. Following his controversial endorsement, the War Department offered him a command with a temporary promotion to brigadier general. His autobiographical entry in the Cullum Register of USMA graduates, however, states he declined "because of desire of superiors to retain his services within (the) continental U.S." Jones remained at the Army War College with its temporary promotion to colonel until September 1939, then accepted a cavalry assignment and transferred from the Air Corps. ↑ The funds, already appropriated, were then used to buy more light bombers. ↑ A coup styled "the revolt of the sergeants" seized the Cuban military and replaced a provisional government sponsored by the Roosevelt Administration with a junta. Although Roosevelt was disposed to intervention only as a last resort, warnings that he intended to intervene under the Treaty of 1903 were made to the revolutionaries. ↑ Four ground force field army headquarters were established at the same time. ↑ Brig. Gen. Charles E. Kilbourne, at the core of the General Staff's disputes with the Air Corps and supervisor of the revision of TR 440-15, authored these suggestions. He also freely espoused his opinion that expansion of the Air Corps was primarily a "selfish" means of promotion for aviators at the expense of the rest of the Army, although on the 669-name promotion list for colonel in 1922, on which he had been 76th, the first airman (later Chief of Air Corps James Fechet) had been 354th. The 1,800 goal was never reached because of General Staff resistance to the "five-year plan", but the War Plans Division did deem it "acceptable" for implementation of War Plan Red-Orange. The Air Corps, based on studies of joint exercises held at Key West, Florida, found the number dangerously inadequate, concluding that 4,459 aircraft was the minimum needed to defend the United States against air attack in the event of War Plan Red-Orange. ↑ The wings were organized both functionally and geographically. The 1st was both the bombardment and the Pacific wing, the 2d the pursuit and Atlantic wing, and the 3rd the attack and Gulf Coast wing. ↑ Andrews and Westover were both 1906 graduates of West Point, with Andrews graduating one position higher in class standings. Andrews had originally been a cavalryman, and had married into the inner circles in Washington, while Westover, a former infantry officer with the unfortunate nickname of "Tubby," had pursued his career with bulldog-like determination. He had not learned to fly until he was 40 years of age and was a reluctant participant in Washington's social environs, usually depending on his assistant Hap Arnold to fulfill the protocol role. As early as 5 May 1919, in a memo to Director of Air Service Charles Menoher for whom he was assistant executive officer, Westover had demonstrated a loyalty to subordination, urging the relief of Billy Mitchell from his position as Third Assistant Executive (S-3) of the Air Service—along with his division heads—if their advocacy of positions not conforming to Army policy did not cease. ↑ The base commander of Selfridge Field was responsible for various aspects of administration to the CG of GHQAF, the Chief of the Air Corps, the commander of the Sixth Corps Area, and the Chief of the Air Materiel Division. ↑ The Woodring Plan (based on the "Balanced Air Corps Program" developed after a two-year War Department study) was another "five-year plan" that called for adding 1,094 aircraft: 144 four-engine bombers, 266 two-engine bombers, 259 attack aircraft, and 425 pursuits, to begin in FY 1940 (July 1939). It was supported by both Andrews and Westover. ↑ The distance is commonly but erroneously given as 725 miles. The Rex was actually that distance in nautical miles offshore on her last position report as the B-17s were taxiing for takeoff. ↑ The B-36 fulfilled the requirements of Project D, the ultra-range bomber envisioned by Air Corps planners in 1935 but rejected by the War Department in 1938. ↑ Arnold called this speech the "Magna Carta of airpower". ↑ Roosevelt's plans were more far-reaching than the speech indicates. At a confidential and historic conference in the White House in late 1938, Roosevelt met with Secretary of the Treasury Henry Morgenthau; WPA Chief Harry L. Hopkins; Solicitor General Robert H. Jackson; Secretary of War Woodring; Secretary of the Navy Charles Edison; General Counsel of the Treasury Herman Oliphant; Chief of Naval Operations Adm. Harold R. Stark; Craig; Marshall; and Arnold. He outlined a vigorous and singular call for 10,000 aircraft, but was persuaded by advisers to cut back the number for political reasons. The date of this conference is in dispute. Arnold, from the notes he made on a manila envelope, stated in Global Mission (p. 177, with which Coffey agrees) that it took place on 28 September while Neville Chamberlain was preparing to return to Germany to complete the Munich Agreement. Other historians, including Gen. John W. Huston, editor of American Airpower Comes of Age: General Henry H. "Hap" Arnold's World War II Diaries, and Mark Skinner Watson, in the Army's official history Chief of Staff: Prewar Plans and Preparations (United States Army in World War II series), date the meeting as 14 November. Huston asserts that the Navy was pointedly excluded from the conference and argues that a number of White House "crisis" conferences were held in October and November, most without written record, and that Arnold confused them, inserting the date (in pencil on an otherwise ink record) in his notes after-the-fact (Huston, Vol. I, pp. 120–121, note 216). Watson indicates that only Roosevelt's "naval aides" represented the Navy (p. 137). Coffey argues that beginning with Roosevelt's weekly press conference of 14 October, the president issued public and private statements that indicated his Air Corps expansion plans were already well underway. William Goss, in his summary for Army Air Forces in World War II, uses 14 November, but concedes that expansion plans were well under way before November, and that Arnold was possibly correct. Greer (The Development of Air Doctrine in the Army Air Arm, 1917–1941) agrees with Arnold and Coffey (p. 100). Because both dates are marked by notable events involving Nazi Germany (the U.S. broke diplomatic relations with Germany on 14 November), the actual date remains unresolved. ↑ The Kilner Board, appointed by Arnold, was chaired by Assistant Chief of the Air Corps Brig. Gen. Walter G. "Mike" Kilner, a veteran pursuit pilot and proponent of an independent Air Force. ↑ Under a program called the First Aviation Objective, the plan called for 4006 combat aircraft, including 498 long range bombers in 14 groups, as well as a substantial increase in pursuit planes and units. ↑ The original goals of the Second Aviation Objective were 84 combat groups; 7,799 tactical aircraft; and the annual addition of 30,000 pilots and 100,000 technical personnel. ↑ The 21 major bases were Barksdale, Bolling, Brooks, Chanute, Hamilton, Kelly, Langley, Lowry, March, Maxwell, McChord, Mitchel, Moffett, Randolph, Scott, Selfridge, and Wright Fields, and the Fairfield, Middletown, Sacramento, and San Antonio Air Depots. ↑ The 15 general officer billets consisted of four major generals, and eleven brigadier generals. In addition, the commanding general of GHQAF was promoted to lieutenant general. Only four Air Corps officers achieved the permanent rank of brigadier general before the AAF was created, and only two of those (Arnold, who was the last of the four, and Andrews) still had air force duties. ↑ These four squadrons were inactivated on 1 September 1936 and replaced by the 61st through 64th School Squadrons inclusive. ↑ Craven and Cate, Vol. 6, p. 31. ↑ Mooney and Layman (1944), p. 117. ↑ Tate (1998), pp. 185–188. ↑ Maurer (1987), pp. 72–73. ↑ Greer (1985), p. 29." ↑ 9.0 9.1 9.2 Craven and Cate Vol. 1, p. 29. ↑ Tate (1998), p. 60. ↑ Maurer (1987), p. 196. ↑ Maurer (1987), p. 200. ↑ Maurer (1987), p. 216. ↑ Maurer (1987), p. 197. ↑ Maurer (1987), pp. 213 and 365. ↑ Maurer (1987), pp. 214–215. ↑ Maurer (1987), pp. 216–219. ↑ Shiner, "The Heyday of the GHQ Air Force, 1935–1939", p. 136, 120, for the GHQAF figure. ↑ Tate (1998), p. 78. ↑ Tate (1998), p. 161. ↑ Shiner, "The Coming of the GHQ Air Force", p. 116. ↑ Tate (1998), pp. 64–79. ↑ Bowman (1997), p. 7. ↑ Eden and Moeng (2002), p. 931. ↑ 31.0 31.1 Cate (1945), p. 17. ↑ Cate (1945), p. 15. ↑ Cate (1945), p. 16. ↑ Greer (1985), p. 113." ↑ Tate (1988), p. 166. ↑ Tate (1998), p. 167. ↑ Shiner, "The Hey Day of the GHQ Air Force, 1935–1939", p. 150. ↑ Nalty (1997), p. 192. ↑ Cate (1945), pp. 17–18. ↑ Shiner, "The Coming of the GHQ Air Force, 1935–1939", p. 133. ↑ Correll, John T. (September 2008). "GHQ Air Force", AIR FORCE Magazine, 91 (9), p.63. ↑ Correll, "GHQ Air Force", pp.63–64. ↑ Tate (1998), pp. 146 and 150. ↑ Maurer (1987), p. 330. ↑ Shiner, "The Heyday of the GHQ Air Force, 1935–1939", p. 146. ↑ Shiner, "The Coming of the GHQ Air Force", p. 159. ↑ Griffith (1999), p. 77. ↑ 65.0 65.1 Craven and Cate, Vol. 6, p. 18. ↑ Correll, "GHQ Air Force", p.66. ↑ 69.0 69.1 Nalty (1997), p. 180. ↑ Correll, John T. (July 2009). "But What About the Air Corps?". , p. 64–65. ↑ Bowman (1997), pp. 7–11. ↑ "Factsheets: Douglas XC-32". NMUSAF. 2009. http://www.nationalmuseum.af.mil/factsheets/factsheet.asp?id=3291. Retrieved 28 June 2013. ↑ "Factsheets: Douglas C-33". NMUSAF. 2009. http://www.nationalmuseum.af.mil/factsheets/factsheet.asp?id=3294. Retrieved 28 June 2013. ↑ Maurer (1987), p. 368. ↑ "Factsheets: Douglas C-39". NMUSAF. 2009. http://www.nationalmuseum.af.mil/factsheets/factsheet.asp?id=3303. Retrieved 28 June 2013. ↑ Craven and Cate Vol. 6, pp. 198–199. ↑ Message of President Roosevelt to the Congress, 12 January 1939 The entire message is reproduced here. ↑ Williams (1953), p. 12. Public Law 18, 76th Congress, 1st Session. ↑ Cate (1945), p. 18. ↑ Futrell (1951), pp. 23–24. ↑ Craven and Cate Vol. 1, pp. 105–106. ↑ Maurer (1987), p. 374. ↑ Futrell (1951), p. 26. ↑ Tate (1998), p. 173. ↑ "Records of the Army Air Forces (AAF)". National Archives.gov. http://www.archives.gov/research/guide-fed-records/groups/018.html. Retrieved 22 November 2010. Futrell, Robert F (1951). "Development of AAF Base Facilities in the United States 1939–1945". Air Force Historical Research Agency. http://www.afhra.af.mil/shared/media/document/AFD-090601-058.pdf. Retrieved 15 January 2011. Greer, Thomas H. (1985). The Development of Air Doctrine in the Army Air Arm, 1917–1941. Maxwell Air Force Base: (USAF Historical Study 89). Center For Air Force History. http://www.afhra.af.mil/shared/media/document/AFD-090601-130.pdf. Retrieved 10 November 2010. Mooney, Chase C. and Layman, Martha E. (1944). "Organization of Military Aeronautics, 1907–1935 (Congressional and War Department Action)". (USAF Historical Study No. 25). AFHRA. http://www.afhra.af.mil/shared/media/document/AFD-090602-051.pdf. Retrieved 14 December 2010. Mooney, Chase C. (1956). "Organization of the Army Air Arm, 1935–1945". (USAF Historical Study No. 10). AFHRA. http://www.afhra.af.mil/shared/media/document/AFD-090602-034.pdf. Retrieved 27 March 2011.